This is the only article you will ever need to get the perfect body shape of your life. This includes Perfect body shape, ideal measurements, the golden ratio, exercises, nutrition, grooming and many more. This is not one of those trashy tips and tricks on how to get the best shape of your life? This is the ultimate guide (probably your last). Everybody has desire to have a perfect body shape. Since it makes you look good and boost your overall performance. A healthy and muscular body needs adequate exercise and a diet pattern with the right number of calories, proteins and other nutrients. For building a perfect body shape, all you have to do is just introduce some healthy habits to your daily life. When you have made up your mind to attain your best shape of your life then there is no coming back. It means you have absolute power to control your physical attractiveness. With a little hard work — pointed in the right direction. And in far less time than you think! Perfect body shape is having a well balanced body according to your height. It’s having the right amount of muscles and fats at the right place. A good physique is not all about getting jacked, it’s about symmetry. I call this “V-tapered” physique. This means your shoulders are wider than your waist — forming a V-shape. Think about Greek statues. That’s a V-taper. Are those statues jacked beyond belief? Nope. Not at all. They’re balanced, symmetrical, with toned muscles and low body fat. 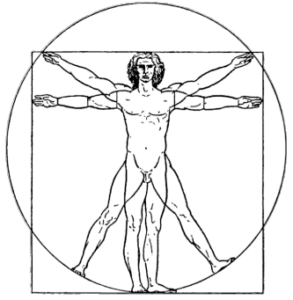 Get excited because you already have the V-taper Golden Ratio (coming next) within you — ALL MEN DO! All you have to do is to get a workout routine specifically designed to build the essential muscles of your V-taper. Get a diet that sheds fat around the bottom part of your V-taper while it simultaneously supports your build. It is 1.618. Don’t get frightened. I’m here to explain how it applies to your journey towards a powerful, attention-grabbing and attractive figure. In order to achieve a V-Taper golden ratio, you’ll need to get as close to the perfect waist:shoulder ratio as possible while still developing muscles in other areas to compliment it. By using this ratio as a rule, you’ll force yourself away from the common ideology that ‘bigger is better’ and instead focus on symmetry and proportion. According to this principle, the perfect male torso will consist of shoulders that are 1.618 times larger than his waist. Because the formula is based on a ratio as opposed to concrete, unalterable numbers, the Golden Ratio enables you to achieve an aesthetically pleasing physique that’s in-line with your natural frame size. 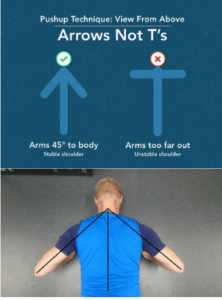 The perfect V- Taper body measurement can be acquired by multiplying your waist size to 1.618 and the resultant will be your ideal shoulder size. The idea is to keep your waist to shoulder ratio by 1:1.628. Let’s crunch some numbers and compare two very different body types. A man with a small bone structure has 28 inch waist. Another, larger man has a 32 inch waist. They can both achieve a V-Taper by ensuring that their shoulders are 1.618 times bigger than their waists. 32” waist x 1.618 = 51” shoulder width. This is the measurement which makes men look like Greek Gods. You might have got the idea that this is not about being jacked and ripped to extreme. It’s all about being in ideal ratio. The symmetry and well balanced physique. Waist – 45-47% of height – Waist size is the building block of a great physique. Too much extra padding around the middle, and the entire aesthetic suffers. A waist size of about ~45% of your height indicates fairly low body fat percentage and an overall athletic build (also, probably a nice set of abs). Shoulders – 1.618 x waist – Broad, powerful shoulders are a hallmark of masculine physique. They indicate strength and confidence, along with an abundance of testosterone. A shoulder width of just over one and a half times your waist size will make your upper body pop, and help give you that coveted V-shape. Arms – Circumference of the neck size – Everyone wants huge, muscular arms, but your frame can only handle so much based on your height. A good number to shoot for, in terms of impressive and well-proportioned arms, is the same circumference of your neck. You’ll want your biceps and triceps to be equally strong and well-developed for the best results, as well as staying lean to reveal plenty of definition. Chest – 10-12″ greater than waist – Big shoulders and a wide back are the foundations of the V-shape that helps make up the perfect male body, but without a powerful chest to go with it, the proportions will be all off. 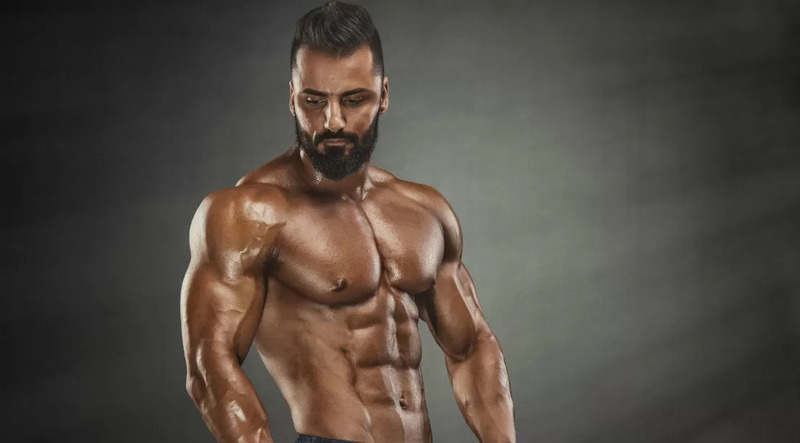 Your chest won’t necessarily give you a ton of extra width to your frame, but will give you thickness from the side and make your waist and stomach area look even smaller. The upper chest in particular forms a powerful looking shelf when built properly. Before we go to the exercises we must know the most important thing which is stretching. And another important thing which is even much more important than stretching is the squeezing of the muscles. No matter how hard you train, how many reps and sets you do. When you won’t squeeze the muscles while doing any exercise the results will be so less than you would have expected. The bottom line is do quality over quantity. Squeeze the muscles and then release while doing particular exercise targeting particular muscle. Then only you will reach the peak of pump which feels good and helps you build the better and stronger muscle with high definition. Stretching is a key component to any exercise and training routine we do. Good flexibility allows you to perform tasks better and keeps your muscles, bones, and joints supple, so stay flexible and bendy. It even prevents your body from getting the stretch marks which most of the rookie people get after losing weight or bulking up. Raise your arm to shoulder height and bring your arm across the front of your body. If using your right arm, your right hand should rest at your left shoulder. 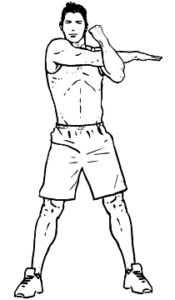 Take your left arm and place it behind your right elbow. Slowly and gently apply pressure just above your right elbow to feel a stretch in the back of the right shoulder. Hold for 30 seconds and then repeat for the other side. position for 20 seconds and then repeat for the other side. Kneel on your right knee and place your left foot 1-2 feet ahead of your right knee. You should be in a straight line (similar to the bottom position in a lunge). Hold the stretch for 30 seconds and then switch sides. Since our chest muscle group is build up of many muscles (I’m not naming them here), you must be targeting all the chest muscles for a firm, wider chest. I have categorized 5 types of push ups to target those 5 chest muscles. Which you will need in order to get perfect body. Note: While doing any push up exercise make sure your elbow makes an arrow shape seeing from the top. And always breathe in while moving upward and breathe out while going downward. Keep your hand as wider as your shoulder on the ground. Lower yourself until you your chest is barely touching the ground (breathe out ). Move upward as much as you can with your hands and feet on the ground (breathe in ). It goes same as normal grip push up but the only difference is you have to Keep your hands much wider than your shoulder in the ground . Place your hands on the ground forming diamond shape with your palm. And then everything goes same. Breathe in while going upward and breathe out while going down. While making the arrow with your elbow when seeing from top. Keep the abs braced and body in a straight line from toes to shoulders. Place the hands on the floor slightly wider than shoulder-width apart. Elevate your feet onto stairs or a bench. Slowly lower yourself down until you are 2 inches off the ground. Push through your chest, shoulders and triceps to return to the start position. Keep your body in a straight line at all times. This is just the reverse of declined push up. The only difference would be your hands will be on the stairs or the bench and your feet on the floor. Note: Do 3 sets of 15 reps with one minute rest. That’s enough for body weight chest exercise. This is as basic as it gets. You’ve probably heard serious lifters carrying on about oblivious meatheads taking up space in squat racks to do bicep curls, so be mindful when and where you load up a barbell — but that shouldn’t be an excuse to skip out on the move entirely. Barbells allow you to work both arms simultaneously and evenly, and the position of your grip can allow you to home in on different parts of the muscle. Grab the barbell with an underhand grip, with your hands positioned about as wide as your hips. To emphasize the inner portion of the bicep, take a wider grip; to target the outer part of the muscle, bring your hands closer together. Start holding the bar at hip height, then squeeze your core and contract your biceps to curl the bar up to shoulder height. Squeeze your biceps at the top of the movement, then slowly lower the weight back to the starting position, controlling the weight through the eccentric movement. Make sure to keep your feet solidly planted throughout the exercise, and don’t use your hips to lift the weight. Grasp a fixed overhead bar with a close underhand grip. 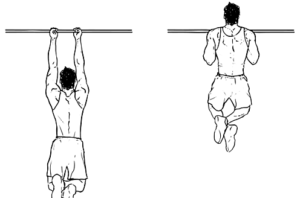 Hang freely from the bar, arms fully extended and ankles crossed behind you. Contract your lats and bi’s to bring your body upward, concentrating on keeping your elbows tight to your sides. 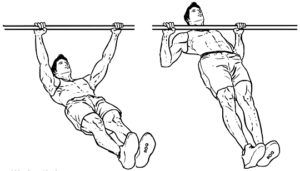 Hold momentarily as your chin crosses the level of the bar, then lower yourself to return to the dead-hang position. Set a bar at hip height in the smith machine or squat rack. Lie underneath the bar and grab it with an underhand grip an inch or two wider than shoulder width apart. Row yourself up the top position with your upper back and lats. Keep the abs braced and body in a straight line from toes (knees) to shoulders. Slowly return to the start position. 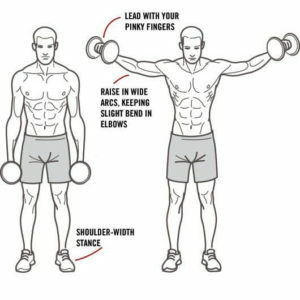 Pick a couple of dumbbells and stand with a straight torso and the dumbbells by your side at arm’s length with the palms of the hand facing you. This will be your starting position. While maintaining the torso in a stationary position (no swinging), lift the dumbbells to your side with a slight bend on the elbow and the hands slightly tilted forward as if pouring water in a glass. Continue to go up until your arms are parallel to the floor. Exhale as you execute this movement and pause for a second at the top. The Pull up is an upper-body, compound exercise. Your back and arms pull your body up while your abs prevent your lower back from arching. You can emphasize your arms by gripping the bar with your palms facing up. 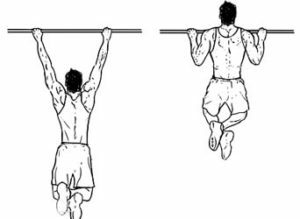 These are Chin ups and they’re effective for building bigger arms. For targeting the core and abs you can also curl left and right while hanging . Abs! Abdominals! Your six-pack! The core muscles! No matter what you call them, everybody wants them. Whether you’re training for sports, bodybuilding, or just to look good on the beach; whether you are male or female, young or old, it doesn’t matter. There’s not a single person who doesn’t want a lean, tight, fat free set of abs. The trouble is, getting great abs is not easy. Most people will waste years of effort and hundreds or even thousands of dollars on all the latest infomercial gadgets and diet gimmicks, trying in vain to obtain that ever elusive lean, muscular six-pack stomach, with nothing to show for their efforts. You Condition and Strengthen Your Abs with Specific Ab Exercise. But the Secret to Seeing Your Abs Is Reducing Your Body Fat! You get great abs from reducing your body fat, and you reduce your body fat by creating a caloric deficit through nutrition and metabolisms stimulating and calorie-burning exercise such as HIIT (High intensity interval training). You can target your abs by doing many exercises such as sit ups and hanging upside down from the pull up bar doing upward curl. But the main thing for great and well defined abs are in the nutrition. Abdominals are made in the kitchen, not in the gym. You can do thousands of reps of ab work every week, but if your nutrition is not in order, you can forget about getting a great set of 6-pack abs. Eat about 15-20% below your calorie maintenance level. If you use a more aggressive calorie deficit of 25-30%, then do not keep calories too low for too long; increase your calories to maintenance or maintenance +10-15% 1-2 days per week. Spread your calories into 5-6 smaller meals instead of 2-3 big ones. Be very conscious of portion size. If you eat too much of anything (even “healthy” food), you can say goodbye to your abs. Period. Choose natural, complex carbs such as vegetables, oatmeal, yams, potatoes, beans, brown rice and whole grains. Start with approximately 50% of your calories from natural carbs and reduce carbs slightly (especially late in the day) if you are not losing fat. Keep total fats low and saturated fats low. Aim for 20% of your total calories from fat (and no more than 30%). A little bit of “good fat” like flaxseed oil, fish fat, nuts and seeds, and so on, is better than a no-fat diet. Essential fatty acids actually assist the fat burning process. Drink plenty of water—a gallon a day is a good ballpark to shoot for if you are physically active. Legs, Butts, thighs and calves can also be built by jogging, squats, stretching etc… And here are some of the squats which helps you build the perfect lower body. Stand with your feet just greater than shoulder-width apart. Start the movement at the hip joint. Push your hips backward and “sit back into a chair”. Make your hips go back as far as possible. Squat as deep as possible, but keep your low back tensed in a neutral position. Push with your glutes, hamstrings, and quadriceps to return to the start position. Do NOT round your lower back..
Raise your hands up over your head. Keep your arms straight and palms forward. Pull your shoulder blades together. Stand with your feet shoulder-width apart. Step forward with one leg, taking a slightly larger than normal step. Keep the ball of your other foot on the ground and use it to help keep your balance. The back knee must also be bent and lowers to 1-inch from the ground. Keep your upper body upright and your low back flat. Push with your front leg to return to the starting position. Step forward with your right leg, taking a slightly larger than normal step. Press the front of your back foot (left foot) into the ground and use it to help keep your balance. The left knee should also be bent. Lower your body until your right thigh is parallel to the ground. Push up to the upright position, but don’t step back. Stay in a split-squat stance. You are what you eat and how you eat. Your body needs food for three main reasons. First as fuel in order to keep you warm and deliver the energy you need to stay active and functional. Second, healthy foods help to supply the need ingredients for development and to repair worn tissues. Third, your body requires minerals, nutrients, vitamins and other substances that are indispensible for the chemical processes that take place inside our bodies. Foods that are overly processed, microwavable, frozen or canned tend to weight us down. Try consuming foods that are rich in the nutrients that your body needs. Some examples of proper, healthy foods you should be eating include honey, tomatoes, carrots, orange, broccoli, blueberries, and bananas. Looking at that, you can see we have all different colors of the rainbow. This should be the goal. Note: Swap all white grains to brown ones. Eat brown bread, brown rice and brown sugar instead of white. Avoid red meat, salt, sugar, and spicy food as much as you can. 1). High Quality Protein – Protein builds and repairs muscle tissue and is the most important nutrient for those trying to increase their lean mass. Stick to high quality, easily absorbed sources such as lean red meat, poultry, fish, eggs, skim milk, cottage cheese, peanuts/natural peanut butter and whey. 2). High Fiber, Low Glycemic Carbohydrates – Carbohydrates aid in the absorption of protein, provide your muscles and brain with energy throughout the day and also help to maintain an optimal hormonal environment within the body. Stick to slow-release, low-glycemic sources that will provide you with a steady stream of sugars throughout the day such as oatmeal, yams, certain fruits, brown rice and whole wheat products. 3). Healthy, Unsaturated Fats – Not all fats will make you fat, and essential fatty acids (EFA) fit that profile. EFA’s are highly beneficial to the muscle growth process by increasing testosterone levels, improving the metabolism and volumizing the muscle cells. Some good sources of EFA’s include fatty fish, nuts, seeds, avocados and liquids like flaxseed and olive oil. These 3 food groups should make up the bulk of your diet, and should be spread out over the course of about 5-7 small meals daily. It may seem like a lot of work at first, but over time you’ll get used to it. If you really think that pills, powders and drink mixes are going to build your body for you, you’re in for a huge disappointment! It continues to amaze me how much value and emphasis the majority of trainees place on “the latest breakthrough pill”. A supplement is just that a supplement. It is there to supplement your diet by filling in the missing gaps and by providing you with greater amounts of specific nutrients that will slightly speed up your progress. Supplements are NOT there to do the work for you and will only play a small role in your overall success in the gym. Stop falling for the multi-million dollar ads that talk about the latest “revolutionary discovery” that will allow you to build 25 pounds of muscle while you lie on the couch. As advanced as we’ve become as a society, the basic rules of hard work and dedication still apply. If you want to change your physique, then hard training in the gym and a consistent diet plan is the only true way to get there. Now, this doesn’t mean that I’m AGAINST the use of supplements; I’m merely against the over-use and over-emphasis of supplements. There are a few good, solid, effective products out there that I do recommend, but only as a small part of your overall approach. #1 – All calories are NOT created equally! If you want to gain weight, then Provide your body with a surplus of calories by ensuring that your caloric intake exceeds your caloric expenditure. And for weight loss, burn more calories than you take. Your obvious goal is to build lean muscle mass while keeping body fat gains at a minimum, and therefore you’ll need to focus on consuming the right types of calories from the proper food sources. And hey if you want to lose weight in minimum time possible, I do recommend a perfect body weight loss supplement. But if you are not running short on time then you can go with the calorie intake formula. Which is to eat less calorie than you burn in order to lose weight. #2 – Avoid over training by limiting your overall workout volume and by providing your body with sufficient recovery time in between workouts. This is one of the most common and most deadly mistakes that almost all beginners run into. They naturally assume that the more overall work they perform in the gym, the greater their results will be. In almost all aspects of life this basic logic holds true. If you want to perform well on a school test, you need to maximize your studying time. If you want to improve your skills in a specific sport, you need to practice as much as possible. When it comes to training for muscular size and strength, you can take this basic logic and toss it right out the window, down the street and around the corner! The key thing to realize is that your muscles will NOT grow larger and stronger if they are stressed beyond the point of recovery. Remember, training with weights is merely an activity that sets the wheels in motion; it “sparks” the muscle growth process and “tells” your body to start building new muscle tissue… But the actual growth process takes place away from the gym while you’re eating and resting. If you disturb the recovery process, your muscles cannot rebuild themselves. Over-training is your number one enemy! Your goal in the gym is to perform the minimum amount of work necessary in order to yield an adaptive response from the body, and not a THING more. #3 – Understand that application and consistency is EVERYTHING! You can have the most effective workout schedule possible, the most intelligent diet approach available and the most intimate understanding of muscle growth from every possible angle, but without the inner drive and motivation to succeed you will get nowhere, and very fast. Those who make the greatest gains in muscular size and strength are the ones who are able to continually and systematically implement the proper techniques on a consistent basis. Building perfect body is a result of the cumulative effect of small steps. 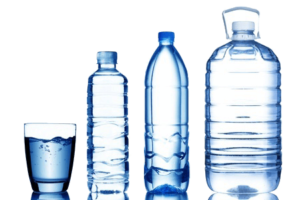 #4 – Increase your water intake. Water is an absolutely critical component to the muscle-building process and to overall body health in general. Failing to keep yourself properly hydrated throughout the day will have a negative impact on literally every single process within your entire body! Most people know that they should be drinking “plenty” of water every day, but how many actually do? If you really paid close attention to your water intake you’d probably be surprised at how little you actually consume. What makes proper water intake so amazingly important? Well for starters, it’s the most abundant element in your body. It is ranked only 2nd to oxygen as being essential to life. Your body can survive for weeks without food, but without water you’d be dead in just a few days. Roughly 80% of your body is made up of water; the brain is 85% water and lean muscle tissue is 70% water. Research has shown that being even slightly dehydrated can decrease strength and physical performance significantly. In fact, merely a 3-4% drop in your body’s water levels will lead to a 10-20% decrease in muscle contractions. Not only will water increase your strength, but it also plays a large role in preventing injuries in the gym. So, just how much water is enough? To find out how many ounces of water you should be consuming every day, multiply your bodyweight by 0.6. So if you weigh 150 pounds, you should be consuming around 90 ounces of water every day. I know it sounds like a lot, but if you plan your day out properly it shouldn’t be a problem. Keep a water bottle with you at all times and sip from it periodically. Keep water in the places where you spend most of your time: in your car, at work, on your nightstand etc. The quality and quantity of sleep are very important to your health and well being because as you sleep your body regenerates. Ideally, most adults should aim for at least 6-8 hours good quality sleep each night. The best way to ensure a good night’s sleep is to effectively start winding down as the evening progresses, try to avoid using any mobile devices, turn your computer off, avoid any heavy/rich foods after 6 P.M. reading a book or listening to calming music often helps your body wind down in preparation. When we don’t get adequate sleep at night, our entire lives are affected. We can’t focus, we can’t pay attention, we eat more, our hormones get all over the place. Once you get into your routine and it becomes habit, then you will find that your mind has become disciplined enough to maintain the perfect body goals you are looking for. In order to see your perfect body you must have your body hair shaved, waxing can be a superior choice. Body full of hairs can hide all the six- pack abs and tone of your body. It doesn’t look that appealing. But after shaving your body hair all your veins throughout your body pops out. It gets you the perfect vascular look. It looks so cool and that’s where your whole perfect body gets revealed. Nothing feels better than a hot shower after a stressful day especially in winter. But what’s good for the mind is bad for the skin: It flushes away all the healthy, natural oils that keep your skin soft. If you must take a hot shower, limit it to under 10 minutes. Then finish with lukewarm water to close pores, and to limit evaporation of water from the skin. She adds that you should follow any hot shower with body moisturizer, to nourish the skin and restore lost moisture. A lean, athletic, powerful, and chiseled physique. is something which everyone wants. But there is only few who are able to build it. Building the best shape of your life is the best investment you can ever make on yourself. The best shape doesn’t only give you good looks and healthy lifestyle but can also give you the FREEDOM to go wherever you want, wear whatever you want to wear. Many people can’t even wear their favorite shirt because of excessive fats. Or some skinny people don’t look good in any of the clothes they put on. No offence, Love your body the way it is, strive to improve, and enjoy the journey! In this post I tried to include as many things as possible to help get you the perfect body and best shape of your life. Comment and let me know how this post is going to change your life. And one more important stuff before ending this article. Apart from all, the way you present yourself is the real attractiveness a man ever get. 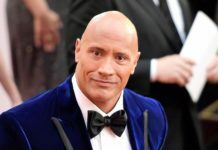 That is body language, behavior, charisma etc… And i strongly recommend you to check out my article on body language of an Alpha Male. This can make you way more attractive than you could ever imagine. Women can’t resist you after this. ➣➣ Click here to discover the shocking secrets to Alpha Male body language. 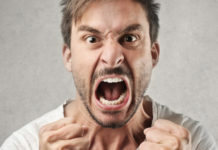 Previous articleBody Language of an Alpha Male – How to develop It? 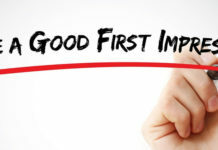 Next articleFirst Impressions: How to Make People Like You Instantly?